Now, there seems to be some confusion in the peak oil community regarding basic probability theory, so I'm going to walk you step-by-step through the meaning of this graph. First of all, the USGS does not regard the amount of undiscovered oil in the ground as a fixed number. It is often claimed, as Rembrandt writes in #232 below, that "the USGS predicts a total of 939 Gb of undiscovered conventional oil and NGL in the world". This is not true at all. 939 is their "mean" prediction. Basically, the USGS regards the amount of undiscovered oil like tossing a die. It's a random process which can turn out different ways. So if you ask them: "How much oil is in the ground?" they don't say definitively: "The die will show a 3." They say: "The die can turn out to be 1, 2, 3, 4, 5 or 6, and we're going to tell you how probable each of those outcomes is." Now, if you roll a die, the mean outcome turns out to be "3.5". So that is basically what the USGS is saying for the "die" of oil production. The die will be rolled one time, and the USGS gives a mean of "3.5". Does this imply that the USGS is wrong if the die shows a 1, or a 6, or a 4? Not really, because they recognized the possibility of all those outcomes. Looking to the graph, notice that the horizontal axis indicates the different outcomes. The worst case outcome is about 200 Gb, and the best case outcome is about 1,300 Gb. The green lines running up from each amount indicate the probability of that outcome. As you can see, the probability is almost zero at the extremes. It is possible that there is 200Gb or 1,300Gb -- it's just highly improbable. The question is: What is the most likely outcome? Well, there are various ways to look it. One way is to look at the most frequent outcome -- i.e. the green stripe which is the tallest. This is the "mode", and here it corresponds to a value of about 500 Gb. Another way is to look at the "average" outcome -- i.e. the mean. In this case the mean turns out to be 649 Gb. Notice also that this curve (which is called the "log-normal density") is different than the usual Gaussian bell curve. It's assymetric and squashed to the left side so that the mode is lower than the mean. 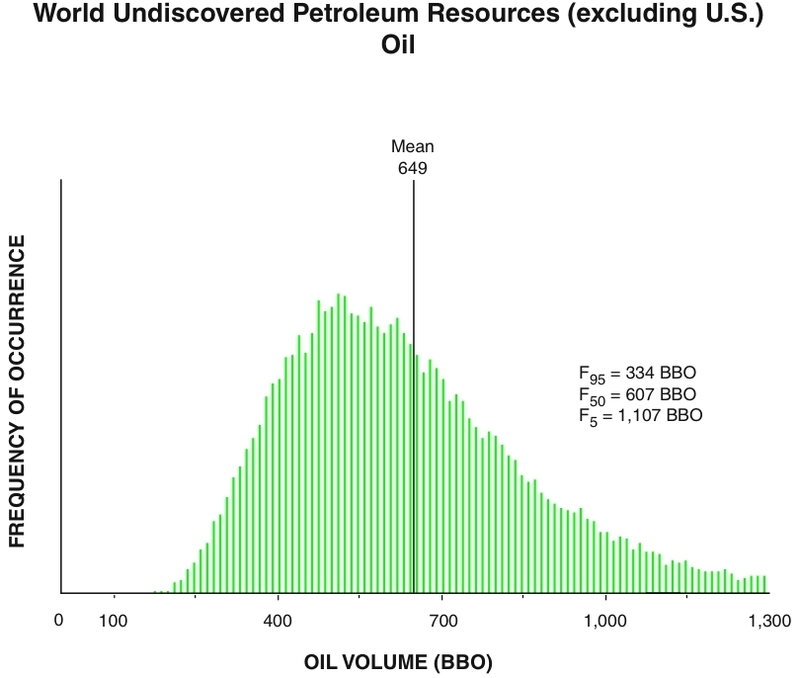 F5=1,107: The probability of undiscovered oil exceeding 1,107 Gb is 5%. F50=607: The probability of undiscovered oil exceeding 607 Gb is 50%. F95=334: The probability of undiscovered oil exceeding 334 Gb is 95%. The F50 value is the "median" outcome. If you ran history over and over again (like rolling a die), half of the outcomes would exceed 607, and half of them would not. If you think about it, finding 607 Gb is basically a matter of flipping a coin, so would you actually bet on a good outcome happening? Would you bet your life on it happening? That would be equivalent to putting a loaded gun and an unloaded gun into a bag, pulling one out at random, putting it to your temple, and pulling the trigger. How confident would you be of a good outcome in that case? That's basically the same amount of confidence you should have toward the outcome of finding at least 607 Gb. Even stranger, notice that the mean (649 Gb) is greater than the median (607 Gb). This means that finding 649 Gb (or more) is even less probable than finding 607 Gb (or more). The oil discovered will exceed the mean of 649 Gb in less than 50% of the outcomes if we run history over. The odds of achieving at least the mean are even worse than the odds of not killing yourself with the guns in the bag game. It's like playing the bag game with the added rule that you are slightly more likely to choose the loaded gun. I don't think anyone would be eager to play that game, so I don't think we should have too much confidence in reaching the mean of 649Gb. I'm a conservative bettor, so I personally would rather put my money on an outcome which is at least 75% probable. Just eyeballing the graph, that would appear to be a value of at least 400 to 500 Gb of world undiscovered conventional oil resources (excluding U.S.). From that number we would also have to subtract discoveries from 1996-2005 (i.e. for the period after completion of the USGS study). Now to plug this into Rembrandt's spreadsheet and see what it means for the peak date? I don't know if you have any background in probabilistic methods but your analysis is almost spot on. The USGS probabilistic analysis is a Bayesian one ... which means that the numbers (probability) have a straightforward interpretation; they represent the belief of the analyst concerning an uncertain event (discovery in our case). This belief ranges from zero (the event will NOT happen) to one (the event will happen). Intermediate numbers are simply a numerical expression of our degree of uncertainty. It can be proven that this kind of analysis is simply "common sense reduced to numbers" as Jaynes wrote. Having established the shape and the parameters of the curve you reproduced, one may actually use it for decision analysis concerning for example the rate/extent of hydrocarbon substitution/utilization etc. Given the importance of hydrocarbons in our society so far, one should be cautious/conservative and go for the "mean" or "median" or even the P75 but for the P95 ... We should start the restructuring of the economy assuming that we will discover no more than P95 GB of oil and take it from there. Now, an average of 25 Gb/year is not a lot knowing that we are now consuming nearly 30Gb/year and growing. Another point is what values they are assuming for the recovery rates. You have also a probability distribution for that factor too! My geology related googling skills are grossly inadequate (oops). Are the probable yet to find models figured into the models which are posted by campbell and the like predicting an early peak? 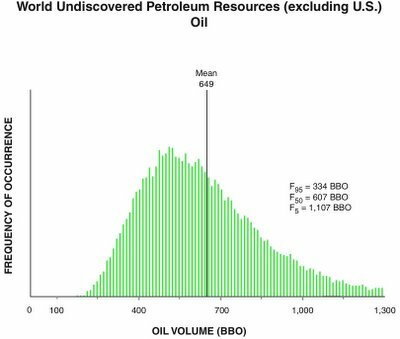 And in models calculated with Yet to find at what point does exploration become economically viable, and is that exploration ever less viable in the financial sense that the known reserves of non-conventional sources (including non-crude sources)? now that I'm thinking about it with all these uncertainties I'm beginning to think the hubbert curve can only be applied after some other source of energy has supplanted the previous one. Where do you get the figure of 25 to 30 bb per year of new discovery? It's probably "oil in place" figure, not ultimately recoverable figure. Normaly you would expect about 30% of the oil in place as recoverable. So that gives you 7.5 to 9 bb per year newly discovered recoverable oil, while the world uses 30 bb per year. i.e., for each 4 barrel you use, there is only one new barrel discovered to replace it. The USGS probability analysis is irrelevant and not credible as long as there is no new discovery to support their speculation. What we know is for the last 40 years there is not a single giant oil field discovered. The fact of the matter is the oil exploration technology is pretty mature now. If a location contains oil and they do exploration in the right area, you bet with good confidence that they will find the oil. So if there is any un-discovered oil, it can not be the case that they explored the place but their technology failed to give them signal there is oil. Rather the reason must be that the area has simply not been explored yet. Now the question is how many of the places that's geologically likely oil containing, remain un-explored? My feeling is all the places where oil could potentially been found have been more or less explored already. The earth is pretty small and we probably have surveyed every inch of the earth surface already. The earth is pretty small and we probably have surveyed every inch of the earth surface already. They haven't surveyed under my house. "The earth is pretty small and we probably have surveyed every inch of the earth surface already." How do you arrive at such conclusions automatically without any real evidence? which is easier to find oil, or fugitives? There is plenty of crime and the technology for tracking criminals is pretty mature, so one must assume there are no criminals at large.......correct? Sorry I made a mistake in my calculations. If you look at Jean laherrere graph, new discoveries seem to have been around 25mbpd~10Gb per year for the last decade. Question: are the USGS estimates about URR or OOIP? It is not an appropriate analogy between finding oil and finding fugitives. New fugitives are created all the time, in cycles of less than 100 years. New oil is not being created. Fugitives run and hide but oil doesn't. The earth has been surveyed thoroughly using all kind of methods. We have identified all geological structures where oil may exist, all all geological structures where oil could not exist. That is a fact. In early years of oil exploration people used very crude methods but discovered all the super giant fields and lots more. Nowadays people use much more advanced technology but make very few and very insignificant discoveries. Would you not agree that most oil fields that are likely there have been discovered already. Put it this way: The less oil left to be discovered, the more difficult it is to discover them, vise versa. So if today it is a 100 times more difficult to discover some new oil than in 1950, that means back in 1950 we had 100 times more undiscovered oil than we have today. That means out of all the undiscovered oil back in 1950, 99% now have been discovered and only 1% is left, and it is so 100 times more difficult now because there is now only 1% left. Hi khebab! Thanks for dropping by. Question: are the USGS estimates about URR or OOIP? Good question. The short answer is: neither. It is also not an estimate of OOIP, unless you assume that all OOIP can potentially be added to reserves in the next 30 years, which seems very unlikely. Basically, the USGS estimates are estimates of oil in the ground, and thus are closer (conceptually) to the idea of OOIP. Also, it is clear (although I can't find the cite right now), that when the USGS says "resources with the potential to be added to reserves", they mean "reserves" in the broadest sense -- i.e. including proven (P1), probable (P2) and possible (P3). We have identified all geological structures where oil may exist, all all geological structures where oil could not exist. That is a fact. actually no it isn't a fact. it's just another quantokenism. Thanks for the answer JD, so if we are talking about a kind of OOIP and taking a conservative recovery rate of 30% in average, if gives around 334x30%=100Gb in 1996! that's not a lot of oil! If I believe Laherrere graph we are discovering about 10Gb (URR?) every year which means we have in fact already discovered F95 since 1996. How is it that you are able to draw close ended conclusions that are perfectly irrefutable without citing evidence and also emphasize the utter impossibility of any positive outcome? I should have written more clearly. The USGS estimates are only like OOIP in that they are estimates of resources in the ground, regardless of political factors etc. Basically, I think it's best to understand the figures this way: They are the amount of oil which can potentially be added to reserves within the 30 year window, provided that political conditions are favorable and sufficient effort is made. So, for example, the figures for Iraq are the amount of oil which could be discovered and added to reserves in Iraq, if the country settled down. The figures differ from OOIP in that the entire amount can be potentially added if conditions are good. I'm still trying to find a clear definition of what they call "field size". I have the feeling that field size= recoverable volume and the recovery rate is already factor in the field-size distribution. to be confirmed. They are also many parameters in their input file that are not documented.